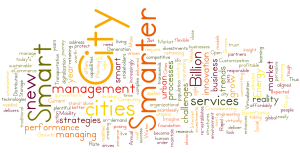 CMG Enables The Smarter City. Smart City Market worth $1,134.84 Billion by 2019. According to new market research report the global smart city market is expected to grow from $411.31 Billion in 2014 to $1,134.84 Billion by 2019, at a Compound Annual Growth Rate (CAGR) of 22.5%. Rapid urbanization of cities is posing infrastructural challenges to governments and municipalities, globally. As more and more people transcends into urban settings, we would require more cities to live in. Current trends show that in the next 20 years, urban population will cross 5 billion marks. As cities grow and expand their services, management and governance become increasingly complex. Thus transformation of the cities is needed to address the social, economic, engineering, and environment challenges. At CMG, we believe that The Smarter City is a new 21st century megatrend that reveals why and how the total digitalization of cities will deliver better living, working, and learning realities with virtually unlimited possibilities. 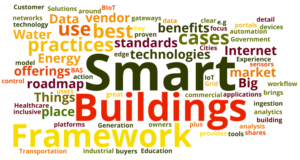 Imagine a reality in which Smart Energy, Smart Water, Smart Transportation, Smart Buildings, and Smart Homes are easily created and affordably maintained to enhance all City services year after year. 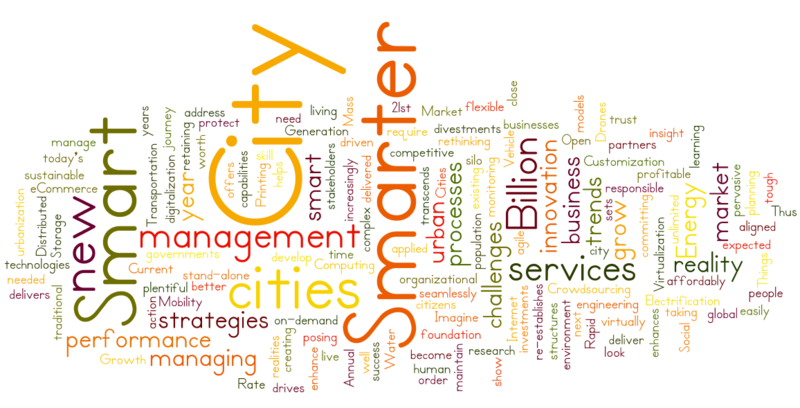 The Smarter City is a non-stop, on-demand, re-design journey of the policies, business models, business processes, technologies, organizational structures, and applied human capital to seamlessly blend existing and new stand-alone silo trends such as, Mass Customization, Open Sourcing, Crowdsourcing, eCommerce, Virtualization, Cloud Computing, Mobility, mCommerce, Social Media, Lean Manufacturing, Vehicle Electrification, Distributed Generation, Energy Storage, 3D Printing, Drones, and Internet of Things into a more socially responsible, more profitable, faster growing, plentiful, and more citizen driven Government reality. The Smarter City delivers success by committing to pervasive performance management, which helps streamline management processes by creating a smart, agile and aligned organizations. The Smarter City enables the close monitoring of performance of services delivered, flexible and integrated planning for sustainability, and re-establishes or enhances trust with citizens and stakeholders. At the same time, The Smarter City drives insight in divestments and investments, and offers techniques that help in rethinking strategies and managing innovation as a competitive advantage. How does The Smarter City maintain a long-term leadership position, as well as manage today’s operations? By understanding its core businesses, taking action to protect and nurture them, retaining the best talent during tough times and constantly managing innovation. These are not only strategies for survival, but also almost always the very foundation of consistent, sustainable, and continued growth. Cities will need to look outside themselves and their traditional partners to find new business models, skill sets and capabilities in order to develop The Smarter City. Key City services by CMG include assessment, planning, architecting and design of the following: Corporate Strategy, Business Models, Business Cases, IT Strategy, OT Strategy, IT/OT Management, Technology Governance, Technology Assessment, Technology Architecture, RoadMap Development, and Innovation Management. CMG has great City expertise in the following technologies and market segments: Smart Cities, Smart Energy, Smart Grid and Microgrids, Smart Water and Smart Pipes, Smart Gas and Smart Pipes, Smart Metering and Smart Devices, Smart Buildings and Smart Homes, Energy Storage, Distributed Generation (Gas CHP, Solar, Wind and Fuel Cells), Smart Transportation, Electric Vehicles and Charging Infrastructure, Energy Management Systems, Network Management Systems, Enterprise Software and Embedded Software, and Telecom Networks.